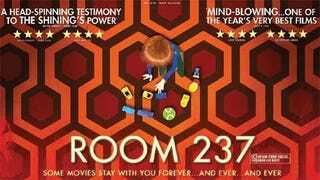 At last Room 237 is out, and it went straight to Netflix. I love The Shining, and I've been looking forward to seeing this for so long. I'm half-way in, and so far there's a lot of weird suitcases=Holocaust crackpot theories to sift through to get to the meaty stuff. What's your favorite theory or interesting detail about The Shining?